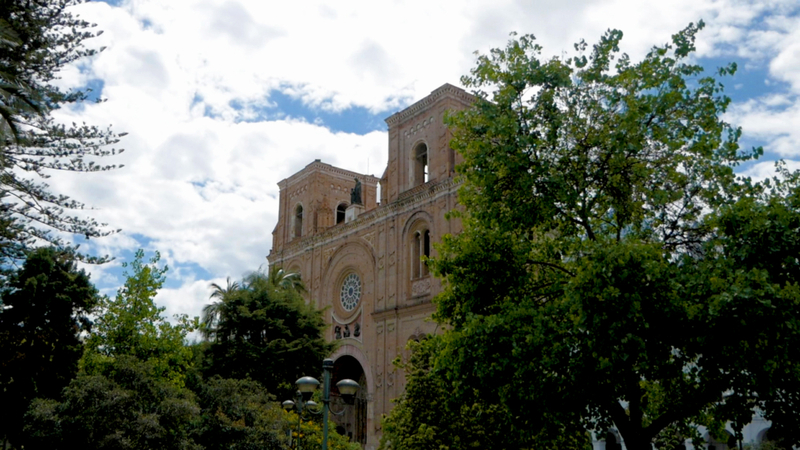 The Cuenca City Tour, operated by Van Service Internacional, is a great way to get beautiful views of Cuenca and the Andes Mountains, as well as learn about Cuenca’s long and varied history. The tour guide speaks in both Spanish and English so us gringos can also understand. We arrived at the City Tour departure area in Parque Calderon a little before 1PM, but they take a lunch break during that time so we had to wait for the 2PM departure. The cost is $8 for adults and $4 for children, and they depart every 30 minutes starting at 9:30AM, except for 1PM and 1:30PM. The Turi bus tour takes about 1:45 minutes with 35 minutes to enjoy Turi. We haven’t taken the northern route yet. Look for that in a future video. We’ve shown the Turi Church in several of our videos since we like to hike the stairs to Turi for exercise. 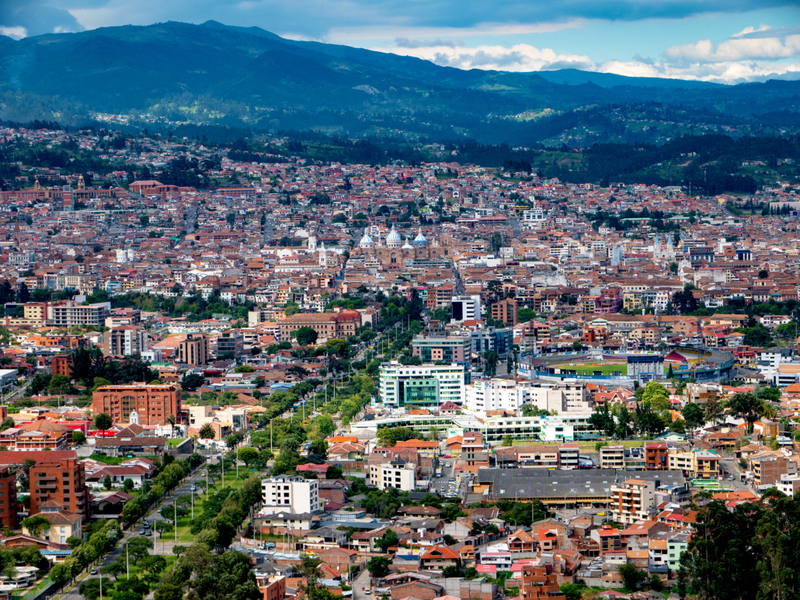 The views of Cuenca and the mountains are breathtaking. Since we had an hour to kill, we decided to hike up to the New Cathedral Terrace, which is open to the public. It costs $2 per person and there are lots of stairs. If you have physical issues, it might be a little too tough for you. The views from the terrace are spectacular! And it’s really cool to be so close to the New Cathedral’s iconic blue domes. It’s well worth the price of admission and the copious stairs. The inside of the New Cathedral is equally stunning. There are several altars around the perimeter dedicated to different important figures in the Catholic religion. There are always lots of people praying and soaking in the beauty of the church. >> Amelia: Hi veggie lovers. I’m Amelia with Amelia And JP. JP is behind the camera. Today, we are going to go on the city bus tour. We already have our tickets. and walk through the cathedral. ..that was noisy.. to answer any of your questions. We are inside the New Cathedral. which we hear has amazing views. We are gonna find out. Oh it’s nice and cool in here. Wow this is really neat. figure out how to open. >> JP: Happens to the best of us. >> JP: Must be for the choir. this Cathedral is still pretty old. The views up here are pretty spectacular. and incredible views of the Andes Mountains. so the church was actually never completed. But they do use this. There are services regularly. will be able to see that as well. they are refurbishing the domes. They look incredibly beautiful at night. We wandered next door to the courtyard. where you can get some souvenirs here as well. And you have an amazing view..
..of the New Cathedral and the domes. When we were in the church, we observed somebody..
just the flower itself; not the whole stem. And he climbed up onto.. I don’t know what it’s called..
rubbed it all over his body. So, never seen anyone do that before. and I guess that was some sort of religious.. I don’t know. What is it JP? >> A: Ritual. Thank you. I’m not religious! white rose for good luck? >> A: I should not make fun. I don’t know. It was just interesting. This is a double-decker bus. which it often does, we can all go downstairs. Also, we have a beautiful view of Parque Calderon. selling tickets so it’s really easy to find. to go see the New Cathedral. We are enjoying the view from Turi. which takes us to Turi, obviously. There’s a little store over there. the the back part of Turi. Today you will just see it from a distance. >> Tour Guide: This is the end of the tour. We really learned a lot on the city bus tour. Cuenca are named after dates. These are important dates in Cuenca’s history. so Cuenca has been around for a long time. and that is Cuenca’s Independence Day. Cueca is a religious city. a lot of different religion. >> A: We have not done that. >> JP: It’s all the same religion. >> A: Well, we don’t know that. >> JP: It’s mostly the same. Yeah, all of those churches are Catholic. 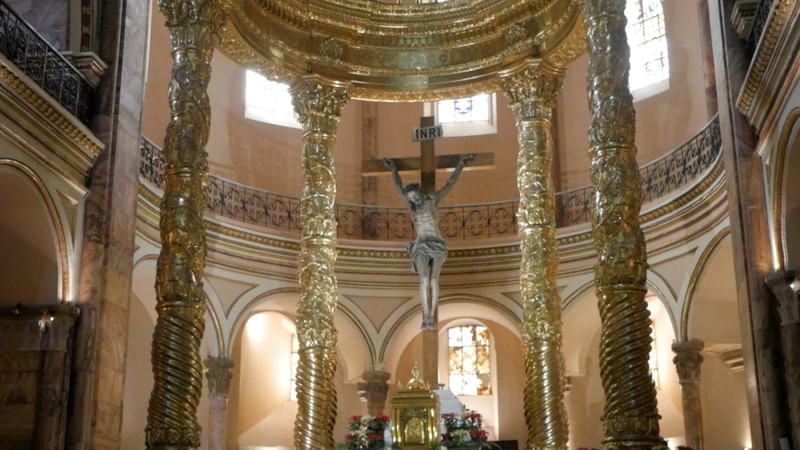 >> A: Lots of Catholic churches. a little tired; the sun was very intense today. But, hey, it’s summer in Cuenca. when in Cuenca during the summer. because the sun is intense.. as I mentioned..
We couldn’t live at Villa de Los Sueños forever and we eventually had to go back home to Cuenca, Ecuador. 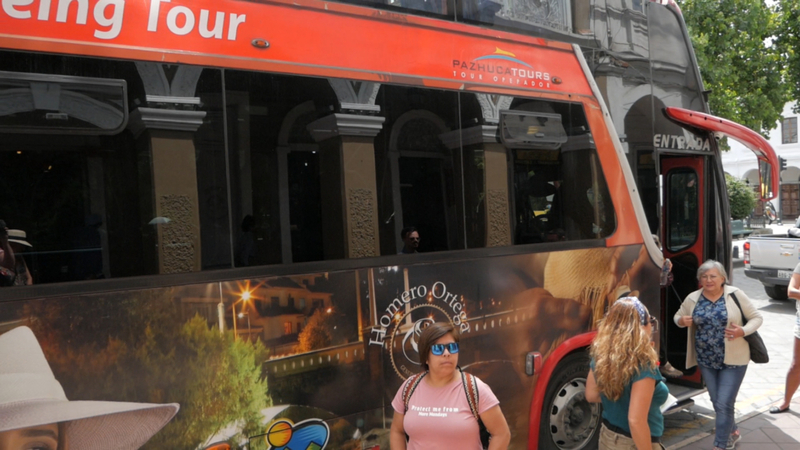 This video covers our Bus Ride from Olón to Cuenca, including the Guayaquil Bus Terminal and the busetas that run between Cuenca and Guayaquil. 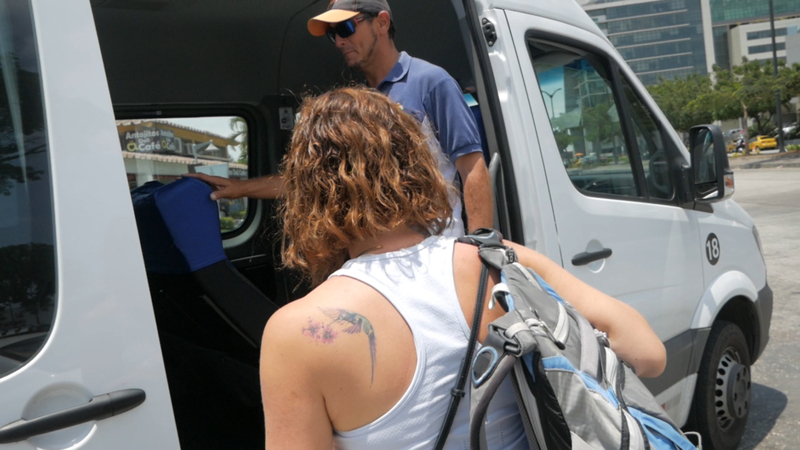 We took a taxi from Guayaquil to La Entrada on our way to the coast, but after speaking with some of the other guests and getting more information from Marsha at the B&B, we decided to take a bus back to Guayaquil. 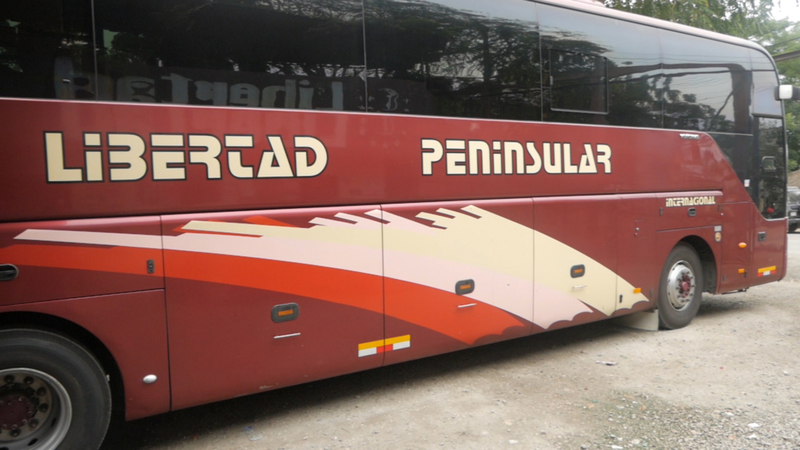 The Cooperativa Libertad Peninsular (CLP) bus was much nicer than the other buses we have taken in Ecuador. The seats were comfortable, the ride was smooth and it didn’t stop as much. I was even able to sleep for about 30 minutes during the 2 hours and 45 minute ride from Olón to Guayaquil, something that NEVER happens to me on public transportation. Once we got to Guayaquil, we took a taxi from the bus terminal to the Operazuaytur buseta office to catch our small bus back to Cuenca. 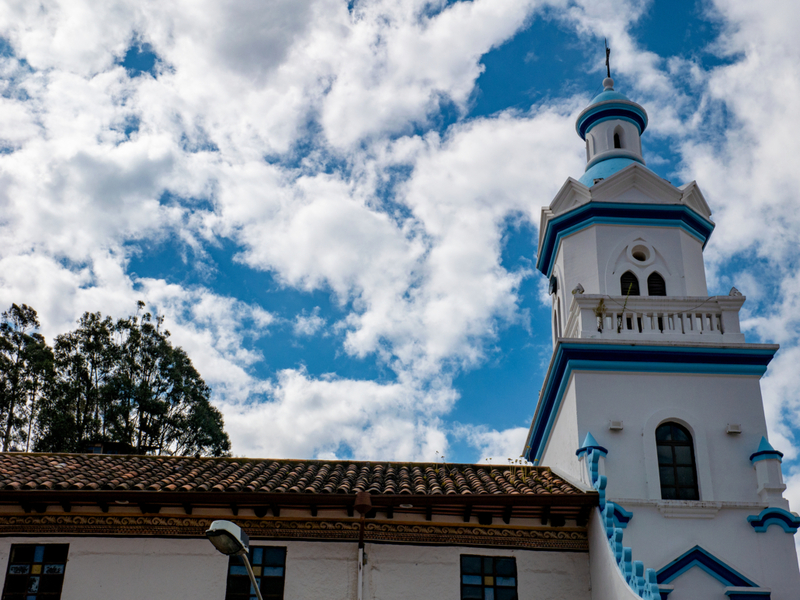 We hope you enjoy the scenery and crazy drivers captured from the window of our bus, as well as our typical humorous interactions as we travel from Olón Ecuador back to our home in Cuenca Ecuador. 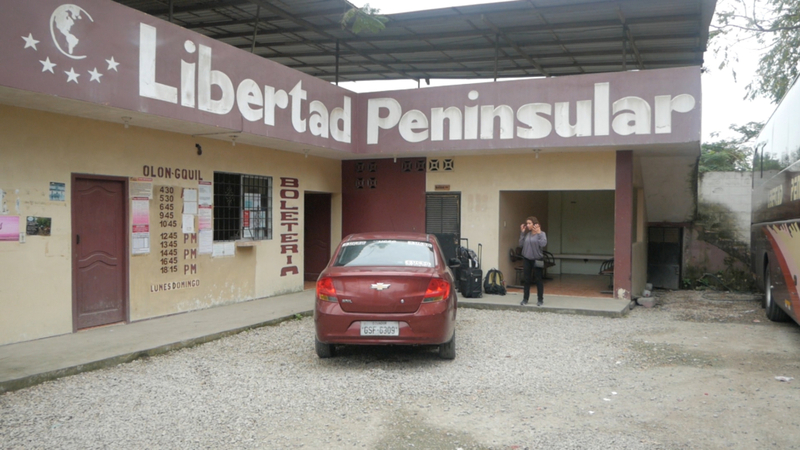 This is the tiny bus station in Olón Ecuador from where the CLP bus leaves. 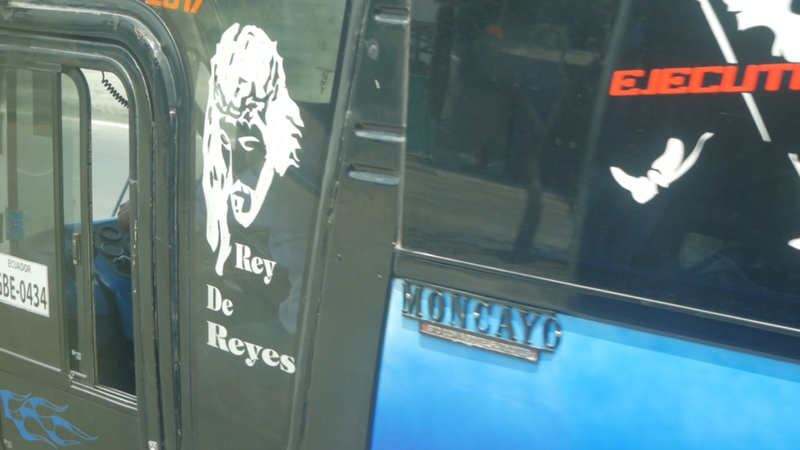 It also stops in Montañita, which is only about 10 minutes from Olón on the way to Guayaquil. The cost was $7 per person one-way, which is about double the cost of the regular interprovincial buses. The bus was large and very nice. It had a smooth ride and didn’t stop as much as the interprovincial buses to pick up passengers along the way, although it did stop more than we thought it would. 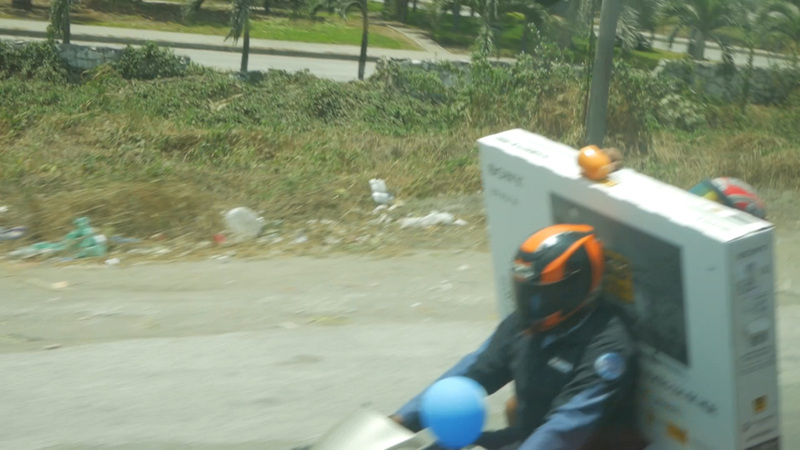 These two guys are transporting a large flat screen TV on a motorcycle…on the highway. Think about that for a minute. He’s basically carrying a sail in a high-wind zone. ¡Que loco! This guy is on track to win the Darwin Award. 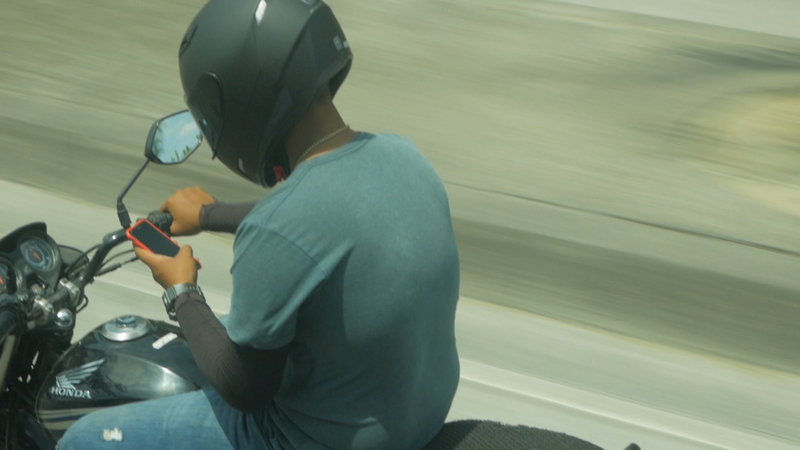 You can see in the video that he was on his phone the entire time I filmed him while he was riding his motorcycle on the highway. Dude. That’s a toilet posture. You’re not on the can! You’re on the highway! On a motorcycle! Pay attention! 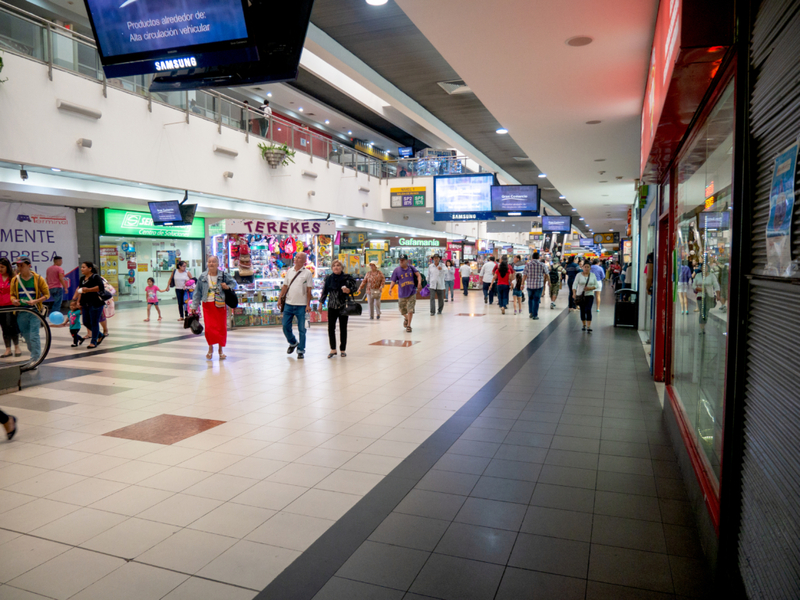 This is the Terminal Terrestre de Guayaquil or the Guayaquil Bus Terminal. It’s located just north of the airport. 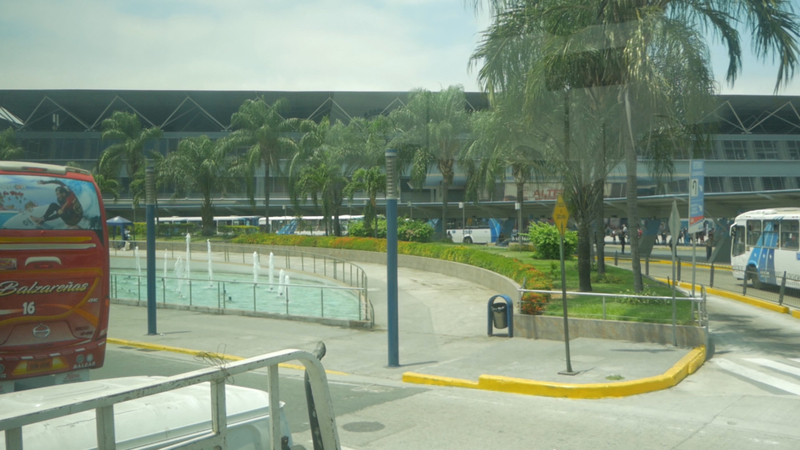 As the crow flies, it would be about a 5 minute walk from the bus terminal to the airport terminal. However, you can’t walk how the crow flies. It would probably be about a 20 minute walk going several blocks out of the way, so the cab drivers make bank charging $5 to drive people the relatively short distance between the terminals. We were VERY impressed with the bus terminal! It was basically a giant shopping mall packed with people coming and going. The restrooms were big, super clean and energy efficient. As usual, the men’s restroom was very quick. It had lots of urinals so I was in and out of there in under 3 minutes. The women’s restroom was a different story. Amelia said it was packed and chaotic, so she opted to wait until we got to the buseta terminal a short cab ride away. 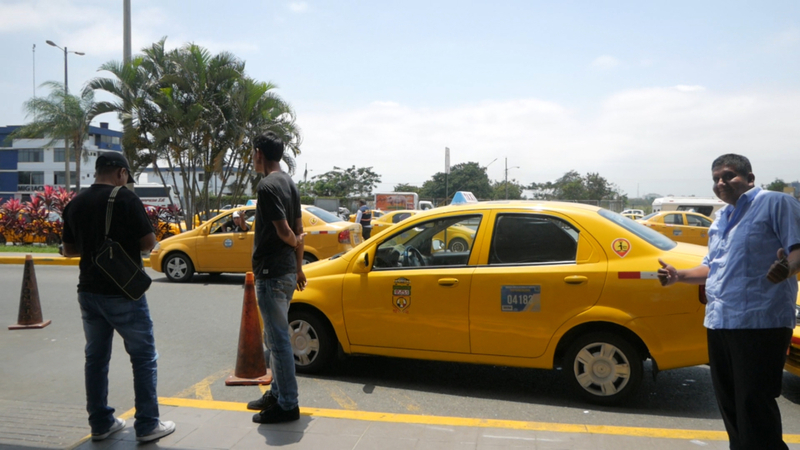 The taxis are located just outside the north entrance/exit on the main floor of the Guayaquil bus terminal. Our diver saw that I was filming and gave us a pose, making his fellow drivers behind him laugh. These guys were goofing around waiting for the buseta to leave at the Operazuay buseta station. 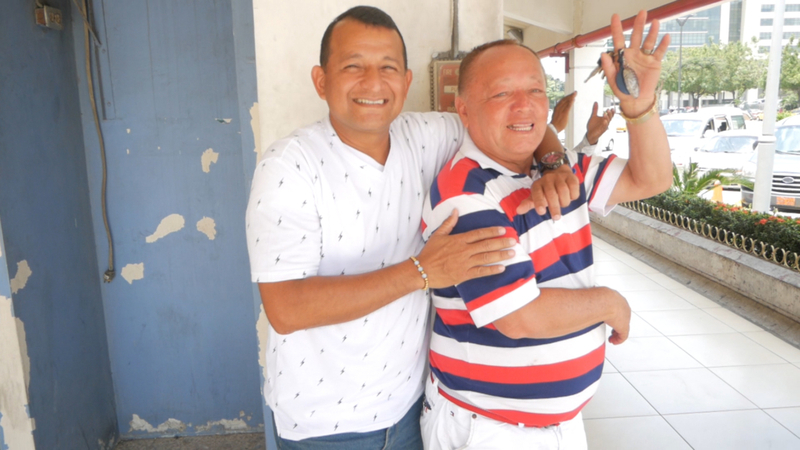 Everyone is so friendly in Ecuador, especially to us gringos. They seem to really get a kick out of us, as you’ll see in our videos. Unfortunately, I didn’t get a picture or usable video shot of the Operazuaytur office, but they were moving to a different location a few days after we were there so it really wouldn’t help anyway. The new office is only a block away, and both are very close (walking distance) to the airport. 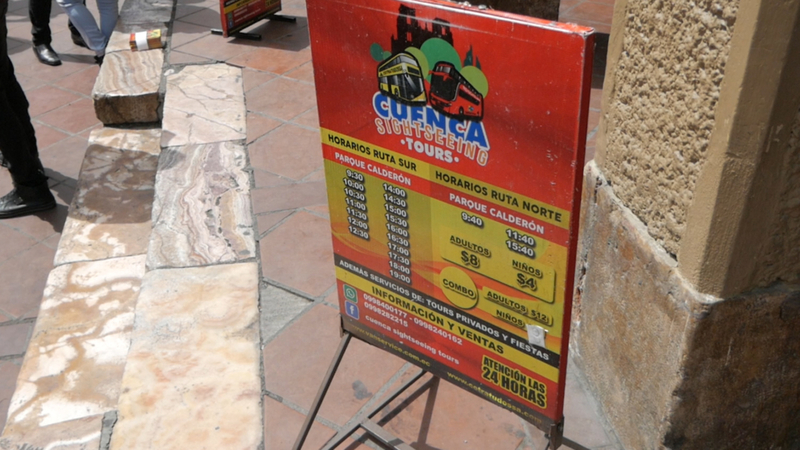 The busetas cost $12 one-way between Cuenca and Guayaquil. I’m not sure where else they go. 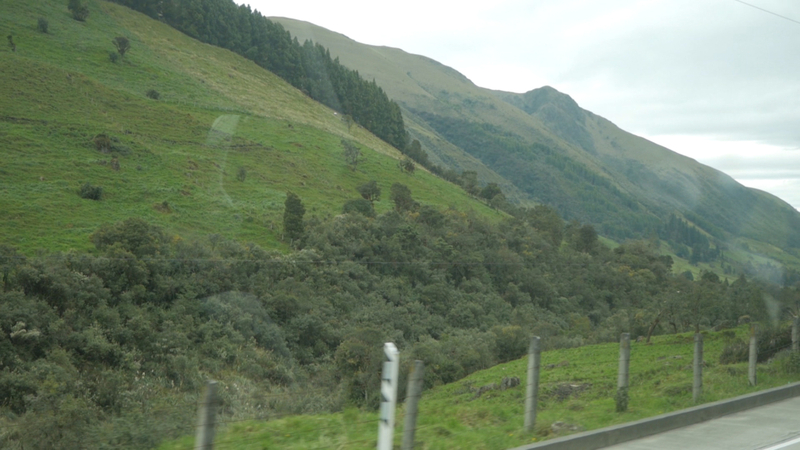 We really liked taking the busetas (small buses) through Cajas National Park rather than a big bus. The mountain roads are very curvy with steep inclines and declines so the smaller buseta is able to handle them much better. 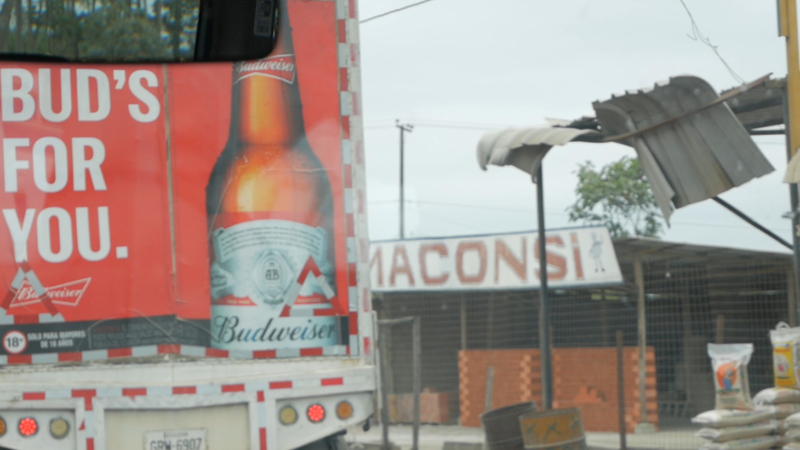 We took a large interprovincial bus between Cuenca and Machala and the motion almost made me sick. I was able to acquire some motion sickness pills for the return trip. I bet you didn’t know Mike Wazowski could skateboard! 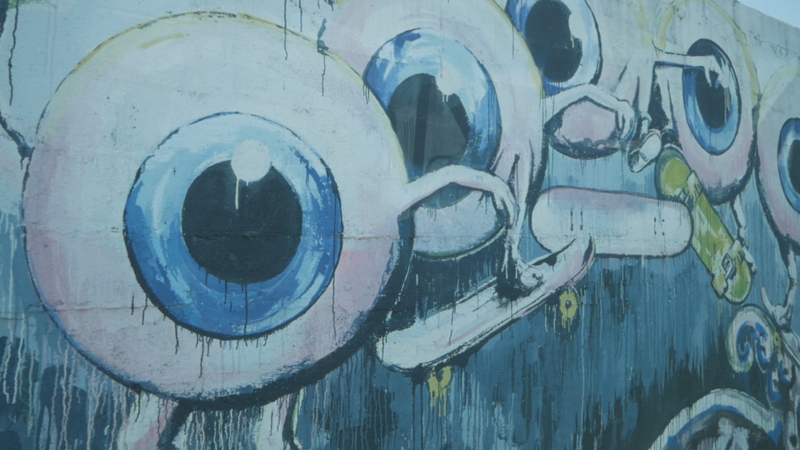 Ecuador is full of murals and I thought these were pretty cool leaving the airport area (more shown in the video). American brands are so common here that sometimes it’s easy to forget we’re in a foreign country. The buseta terminal was directly across the street from a Holiday Inn and there was a Sherwin Williams paint store and a Formica store in the same area as the buseta terminal. Sugar cane is one of Ecuador’s exports, along with chocolate, fruits and flowers. 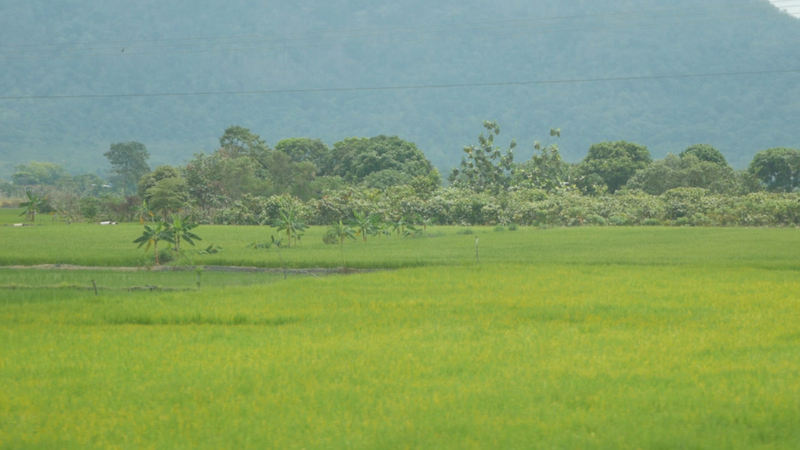 This is a baby sugar cane field that was probably planted within the previous month. The sugar cane will be almost as tall as those trees in the middle of the field once it’s fully grown. 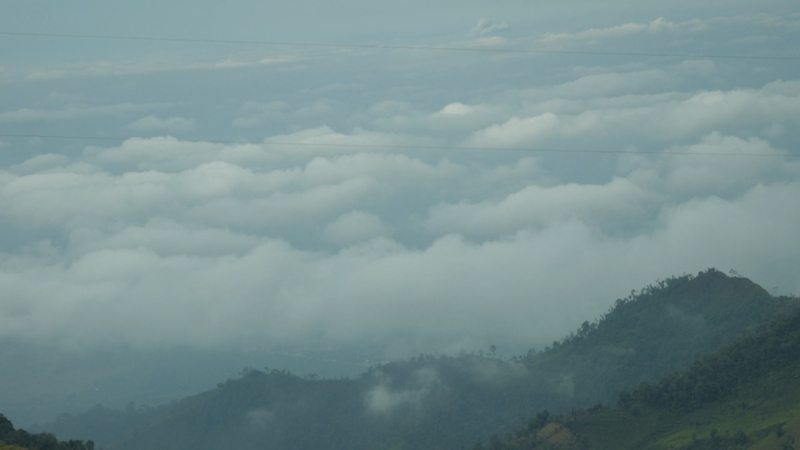 It takes about an hour and a half from Guayaquil to reach the base of the Andes Mountain range. Then it’s a quick climb to ascend through the clouds. Be sure to check out Part 1 in this series to see more beautiful shots of Cajas National Park. Amelia is an expert sleeper. I almost never nap on public transportation, even overnight flights. But it’s common for Amelia to be asleep before they close the door. I’m certainly envious of that trait. Especially when I have to sit there and watch her head bob up and down while I’m bored silly! 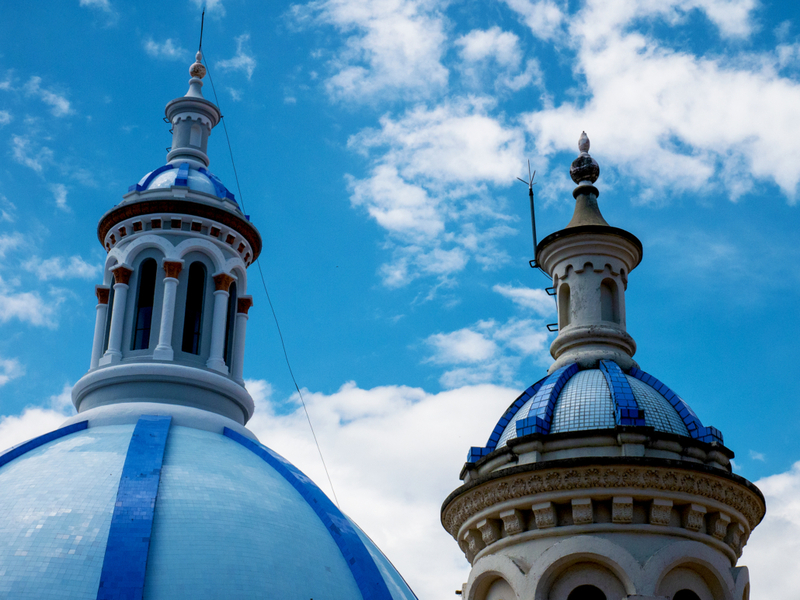 We hope you enjoyed our trip from Olón to Guayaquil and then to Cuenca, Ecuador in the fifth and final part of our first trip to Ecuador’s Southern Coast. Please remember to like, comment and share our video, and also subscribe to our YouTube channel. 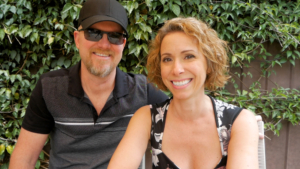 If you’d like us to make a video about something specific or if you have questions, please let us know in the comments.